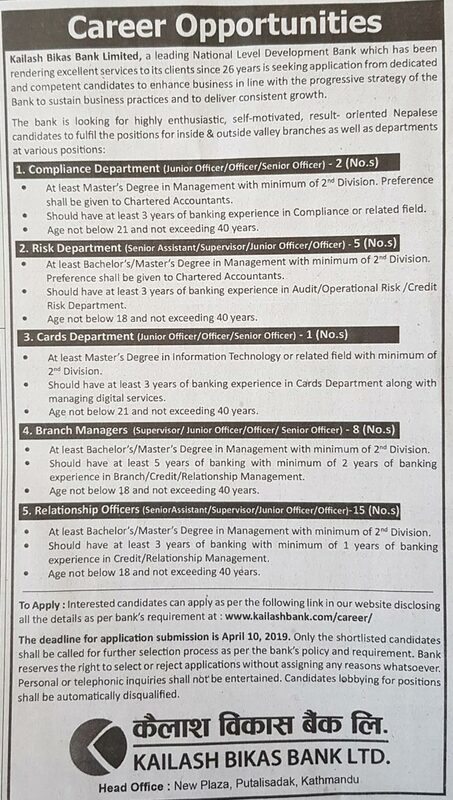 Kailash Bikas Bank Limited, a leading National Level Development Bank which has been rendering excellent services to its clients since 26 years is seeking application from dedicated and competent candidates to enhance business in line with the progressive strategy of the Bank to sustain business practices and to deliver consistent growth. > At least Master’s Degree in Management with minimum 2nd Division. Preference shall be given to Chartered Accountants. > Should have at least 3 years of banking experience in Compliance or related field. > Age not below 21 and not exceeding 40 years. > At least Bachelor’s/ Master’s Degree in Management with minimum of 2nd Division. Preference shall be given to Chartered Accountants. > Should have at least 3 years of banking experience in Audit/ Operational Risk/ Credit Risk Department. > Age not below 18 and not exceeding 40 years. > At least Master’s Degree in Information Technology or related field with minimum of 2nd Division. > Should have at least 3 years of banking experience in Cards Department along with managing digital services. > At least Bachelor’s/ Master’s Degree in Management with minimum of 2nd Division. > Should have at least 5 years of banking with minimum of 2 years of banking experience in Branch / Credit/ Relationship Management. > Should have at least 3 years of banking with minimum of 1 year of banking experience in credit/ Relationship Management. The deadline for application submission is April 10, 2019. Only the shortlisted candidates shall be called for further selection process as per the bank’s policy and requirement. Bank reserves the right to select or reject applications without assigning any reasons whatsoever. Personal or telephonic inquiries shall not be entertained. Candidates lobbying for positions shall be automatically disqualified.